In 2011 BERG + KLEIN won a pitch together with +31ARCHITECTS to design a green neighbourhood at the outskirts of Best, a municipality of around thirty thousand inhabitants. The neighbourhood of 350 houses was supposed to include well designed public spaces, green areas and a share of affordable housing. The urban form is defined by a network of green waterways that divide the plan in small neighbourhoods all connected by a meandering avenue. Along this meandering avenue a series of green squares, with full grown sycamores provide space for people to meet and for children to play. The aim of the design team was to not make a clear distinction between the social housing and the private sector developments and to create diversity within a common architectural language. The plan that has developed over time in close collaboration with the municipality and the project developer aimed at a level of detail and quality that at that time of financial insecurity was an exception. This approach paid off. The outcome of the design work was valued by future homeowners that subscribed to the project, even in the mid of Europes financial crisis. The village-like typology evolved through series of studies on the character of the street, the variety of architectural typologies and the materialisation of public space. The positioning of the houses on their plots, with different set backs and orientation and the consistent denial of the ‘row house’ typology never extending four houses in a row created a playful urban pattern. The Dutch instrument of the ‘Beeldkwaliteitsplan’ that provides the architects and the client on the direction of materialisation, color and detailing really leveraged the output of the 5 different architectural practices that worked under the supervision of BERG+KLEIN and +31architects. The different architects as well as the share of social housing have been scattered and dispersed throughout the urban design. That means no one architect worked on a specific cluster, so the different handwritings coexisted within the framework set by the ‘Beeldkwaliteitsplan’. Also it is almost impossible for the beholder to identify the social housing amidst its more expensive typologies. Mixed social groups that can interact around accessible and well-designed public spaces are the key to sustainable neighbourhoodplanning that BERG+KLEIN advocates. Materiality and color of facades and the streets have been researched with samples of masonry and natural stone. The materialisation of the groundplane is a crucial factor in the experience of the city or a neighbourhood. In the case of Steegsche velden the masonry on the groundplane with only a distinction between the sidewalk and the driving lane is the pattern in which the masonry is applied separated by a subtle masonry drain, all at the same level. The process in which the specific urban design took place has been just as important as the actual design itself. The collaboration between municipality, private developer, urban designers, the municipality engineers and the various architects is crucial for achieving high quality in a plan. Recent inhabitants have taken part in a series of interviews. They all appreciate the green environment, the diversity of the architecture and the fact that they could influence the lay out of their houses and neighbourhood playgardens. Using masonry for the materialisation of public space has become common language in urban design in the Netherlands these days, but it is good to be aware that this has been relatively new in the late nineties and beginning of 2000. 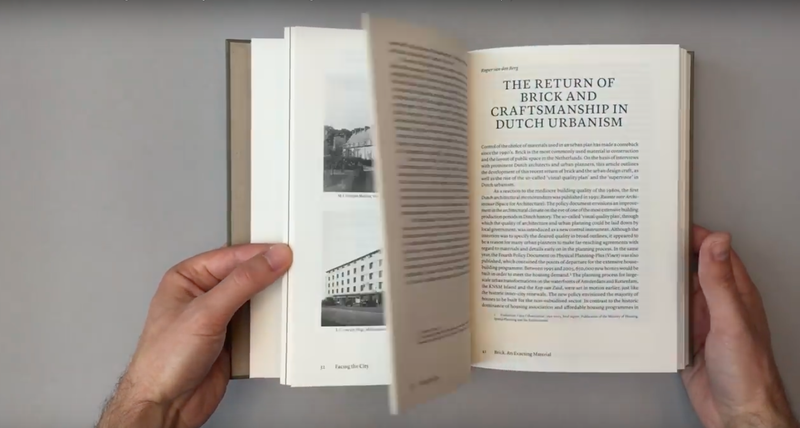 BERG + KLEIN has published a studies on the return of craftsmanship and masonry in urban design in the Netherlands; ‘The return of brick and craftsmanship in Dutch Urbanism’, Published in the book: ‘BRICK, and exacting material’, Architectura & Natura, ISBN 978-94-6140-027-7, Jan Peter Wingender ed.